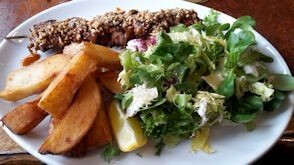 On a recent flying visit to Eastbourne, East Sussex, we discovered several fantastic restaurants. We were seeing our friends Lynne and Jack who had kindly bought some new cakes from Waitrose www.waitrose.com which we hadn’t tried before – and they were wonderful! 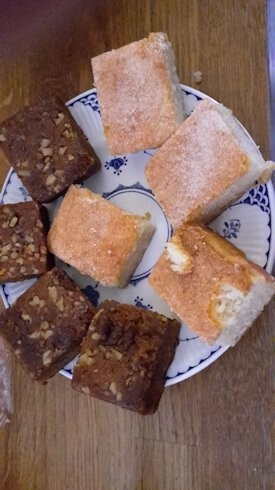 Both labelled “free from gluten and made without milk”, they were coffee and walnut slices, as well as lemon cakes slices – a blend of brown rice flour and ground almonds. What a great discovery and we’ll be buying more. 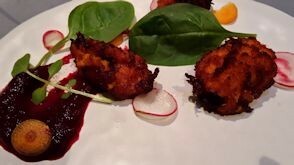 Conveniently located a stone’s throw away from the theatre is Henry’s Bistro www.henrysbistro.com promising Asian fusion cuisine. Lynne had suggested it and I had telephoned in advance to warn them one diner was gluten free and the other was dairy free and received a reassuring email saying that it was no problem. 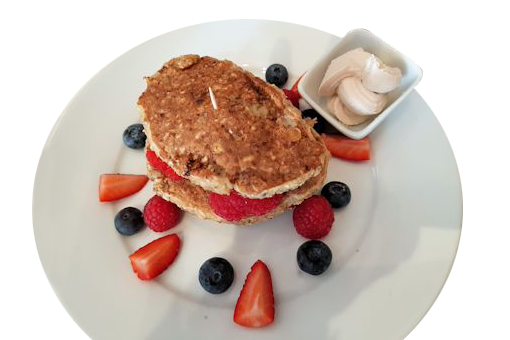 The menu helpfully carries symbols (nf) nut free, (df) dairy free, (gf) gluten free, (v) vegetarian, which is impressive and makes a huge difference, although I do tend to check with the waiting staff that a dish really is gluten free – just in case. The restaurant is small and intimate, so it’s not a problem if the waiting staff has to check with the kitchen as it’s located so close to the front of house area – unlike larger restaurants where the staff have to walk a long way to the kitchen. 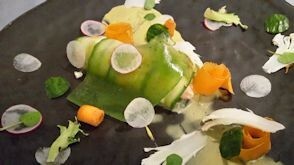 To start with I had salmon ceviche (nf, df, gf) salmon rolled in carpaccio of cucumber and cucumber jelly and avocado puree. 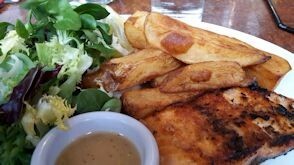 Ray opted for sweet potato cakes (df). 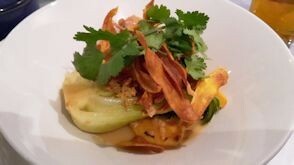 For the main course, we both ordered Thai Peanut Curried Sweet Potato with rice and crispy shallots (v, df, gf). The food was delicious, tasty and beautifully presented. The service was excellent and fast when I explained we were going to the theatre. It’s unusual for Ray and I to have a choice of desserts – usually there is nothing we can have. But at Henry’s Bistro this isn’t the case. There were two puddings that were both gluten free and dairy free – Five Spiced and Vanilla Poached Plums (gf, df) and Coconut Pannacotta with fruit marinated in coconut water and mango sorbet (gf, df). We did query whether the Pannacotta was dairy free, but it’s a sorbet. We didn’t have room for dessert, so we’ll have to go back. 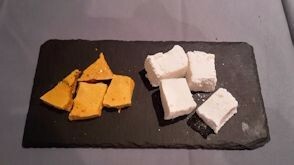 As we were paying the bill, we were presented with some more goodies – honeycomb, both gluten free and dairy free and marshmallow, which was dairy free. Ray & I felt very spoiled. Our friends took us to the oldy worldy village of Alfriston to visit Much Ado Books www.muchadobooks.com with its eclectic collection of books, both new and old on two floors, as well as an array of highly original cards and their own recovered notebooks fashioned from the covers of old books which would otherwise go to the tip. Well worth a visit. After all that book browsing we stopped off at Badgers Tea House, North Street, Alfriston, www.badgersteahouse.com where the tea is beautifully served in pots in china rosebud cups – no unsightly teabags plonked in mugs here! 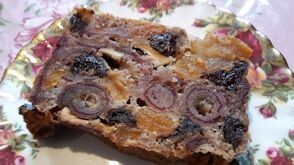 To our delight, there was Molly Cake, both gluten free and dairy free with no added fat, sugar or eggs which was yummy, packed full of dried fruit. Our final meal in Eastbourne was at the quirky Two Bulls at The Tally-Ho, Church Street, Eastbourne www.thetallyho.net where we were given an enthusiastic welcome. On the table is a sign saying how they would like to make us happy by giving us extra chips! There was a special £8 per person gourmet lunch which we opted for – I had the salmon without sauce while Ray enjoyed steak kebabs with Thai peanut sauce (after having checked there was no dairy in it), which he enjoyed.